Such false doctrines attempt to force a sinner to change in order to be saved; instead of allowing God to do the changing in a sinner's heart who comes to Christ by faith to be forgiven and saved. In Calvinism's 'Perseverance of the Saints' and in 'Lordship Salvation,' both false gospels place the BURDEN OF SALVATION UPON THE SINNER. However, in Biblical salvation, God saves the person who acknowledges their sinnership and believes on Jesus as the Christ, the Son of God Who died for our sins, was buried and rose from the dead three days later (John 20:31). The BURDEN RESTS UPON CHRIST, Who took our sins upon Himself at Calvary. As you can Biblically see, there is a vast difference between the different gospels. Jesus said that His burden is light and His yoke is easy in Matthew 11:29-30. Anyone who makes salvation difficult and hard is corrupting the simplicity that is in Christ (2nd Corinthians 11:3-4). Jesus took all our sins upon Himself on the cross. Jesus bore the weight of our sins! Beware of Paul Washer, Ray Comfort, Kirk Cameron, John MacArthur and other Calvinists who place the BURDEN of salvation upon the sinner—demanding that a person amend their ways, forsake the world, stop sinful bad habits, and make a full surrender to Christ in order to be saved. This is a false gospel, heavy laden with self-righteousness. What a heavy burden for anyone to carry! Salvation is by the grace of God, without works! Romans 4:5-6, “But to him that worketh not, but believeth on him that justifieth the ungodly, his faith is counted for righteousness. Even as David also describeth the blessedness of the man, unto whom God imputeth righteousness without works.” To no surprise, Ray Comfort skips over this passage of Scripture in THE EVIDENCE BIBLE. Hmmm, I wonder why? The answer is obvious, because it doesn't fit His Calvinistic false view of the gospel. 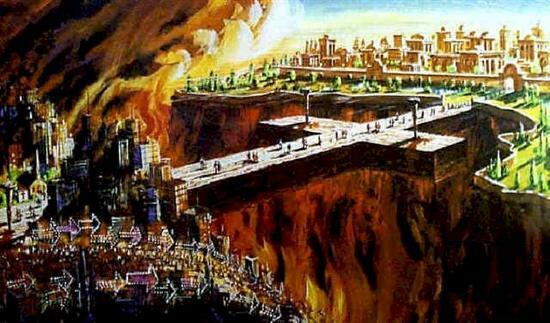 Calvinism's 'Perseverance of the Saints' and 'Lordship Salvation' are false gospels, which will lead a person into Hell. Romans 3:20 warns that no flesh will be justified by the keeping of the law. Many people misunderstand Romans 2:13, “For not the hearers of the law are just before God, but the doers of the law shall be justified.” But here is a solid Biblical answer evidencing that this verse in no way teaches works salvation in view of the context of the entire passage of Scripture. God the Father gave up His only begotten Son so that we wouldn't have to give up anything to be saved. Eternal life is a free gift (Romans 5:15; 6:23; Ephesians 2:8-9). And a good thing, for we have nothing to offer God; “But we are all as an unclean thing, and all our righteousnesses are as filthy rags; and we all do fade as a leaf; and our iniquities, like the wind, have taken us away” (Isaiah 64:6). Thank God the Father for the gift of salvation in Christ Jesus the Son! Jesus is precious! In Biblical salvation, EVERYTHING RESTS IN JESUS CHRIST, the Lamb of God, which taketh away the sin of the world (John 1:29). Our part is simply to come as a SINNER and trust upon the SAVIOR! Repent of your unbelief and believe on the Lord Jesus Christ Who died, was buried and rose from the dead three days later. These three constitute the Gospel: Christ's death, burial and resurrection. Faith alone in Jesus alone sounds good, but is not the way of salvation... “The time is fulfilled, and the kingdom of God is at hand: repent ye, and believe the gospel” (Mark 1:15). You'd better believe that Jesus died on the cross for your sins, and that He bodily raised up from the grave three days later. This is the Good News (Gospel) by which men are saved if they believe. Romans 1:16, “For I am not ashamed of the gospel of Christ: for it is the power of God unto salvation to every one that believeth; to the Jew first, and also to the Greek.” Christ bore the total weight of our sins upon the cross, so that we would not have to bear the weight of our sins in the punishing fires of Hell forever. If you receive the Gospel as full-payment for your sins, then you are saved safely, irrevocably and eternally my friend. Religion is man trying to reach God through human effort, but Christianity is God trying to reach man by the sacrifice of His only begotten Son on the cross. SOURCE: Pastor J. Vernon McGee, THRU-THE-BIBLE, Hosea 3:4.